Check out my other items. This is a Sample of 10 styles that I make. Two of each style are included so you get 20 kits total. It is a deal for anyone who wants to become a distributor. Or maybe you just want a deal for that fundraiser or group project. Be sure and look at the profit per kit below. Don't let the small prices fool you. These are High Value kits. Take a look at my feedback and see what buyers think. Send me any questions that you may have. We designed the Bird House and Bird Feeder kits and produce them in the USA from quality Cypress wood grown locally so they are Eco-friendly. The kits are fun to assemble by kids and adults. Child friendly instructions are included. Perfect for that fundraiser or group project. Each kit can be assembled in less than 1 hour. Each kit is individually packaged ready to display. Bird house with 2 planters. 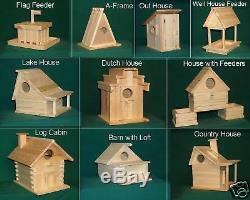 The item "Bird House & Feeder Kit Sampler 10 styles 2 of ea. Hand made in USA AJ1100" is in sale since Friday, January 08, 2010. This item is in the category "Crafts\Kids' Crafts\Craft Kits". The seller is "alanjohnston706" and is located in Rutledge, Georgia. This item can be shipped worldwide. Kits are new to market.